What a day in Greeley Park! 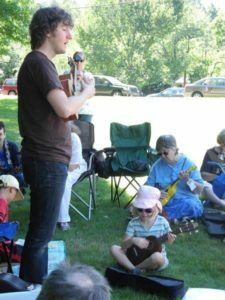 After my onstage solo uke set, I taught classes on chords, strumming, and fingerpicking. Student demographics varied wildly, from little kids to seniors, from total beginners to members of the bands who’d played earlier during the ukulele festival. I knew it would be impossible in that situation to give everybody exactly what they need (can you ever do that, anyway? ), but I tried to make sure everyone got SOMETHING they could use in each workshop, whether they were picking up the ukulele for the first time, or already could play, sing, and jam comfortably. Big thanks to my fellow teacher Amy Conley for bringing her tent and basket of loaner ukes (and for taking these pictures! ), and to Michael and Ben Chung for doing the dreaming and legwork necessary to make this festival happen.